Explore the picturesque Varna area on an 8-hour tour. Accompanied by a guide, discover the beautiful coastline of Cape Kaliakra with ruins dotting the white rocky cliffs. Stop by a snail farm and partake in a wine tasting garden at Balchik Palace, where you can stroll through the Botanical Garden. Learn about the medieval Monastery of Saint Athanasius. Travel comfortably in a climate-controlled vehicle. Meet your guide in Varna center to begin your 8-hour tour of the beautiful surrounding area. Stroll in the direction of the cape, soaking in views of wild steppes and dramatic coastal cliffs. 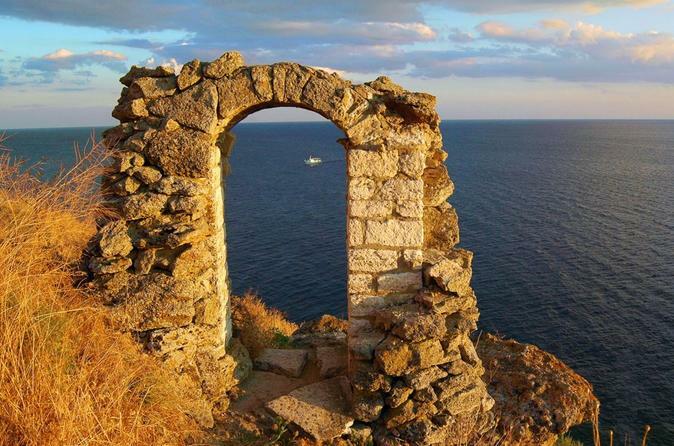 Pass by ancient ruins and wild white rocks and admire the Black Sea. Learn about the local legends of the area from your guide. Visit a local farm that breeds snails and pause for lunch. After lunch, stop for a coffee on the way to a golf village. Go to the seaside town of Balchik and explore the luxurious botanical garden at the Balchik Palace. The garden is made up of hundreds of different plant species and a very rare collection of cacti. Explore the summer residence of Queen Maria and try her special wine at a tasting. Learn the history of the Monastery of Saint Athanasius, a former dervish convent that’s celebrated by both Muslims and Christians. At the conclusion of the tour, your vehicle will return you to Varna.